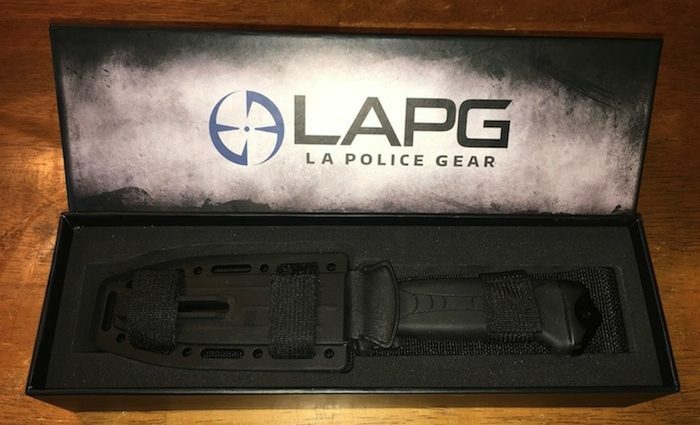 The LA Police Gear Infantry Knife comes in a nice box. 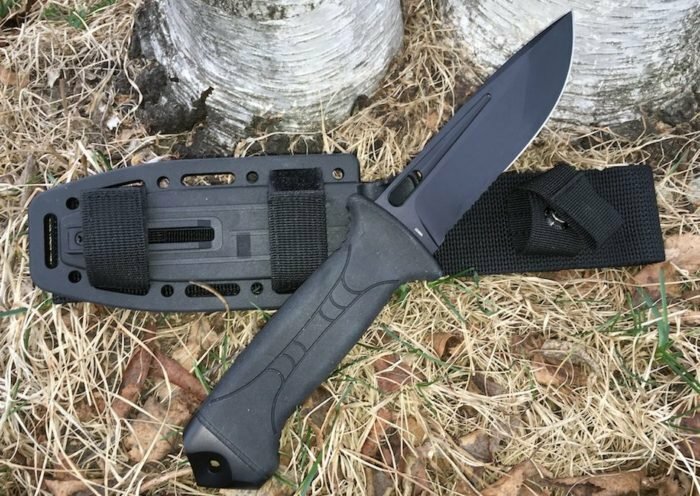 The LA Police Gear Fixed Blade Infantry Knife is up for review, and I’m very confident you’ll be as impressed with this knife as I have been. 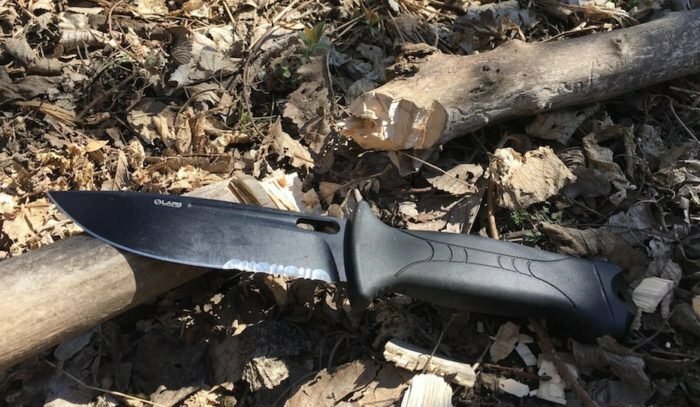 The LAPG Infantry Knife is designed for serious, professional work, but could also be a great camping, hiking, or survival knife as well. The LAPG Infantry Knife as a lot of similar features to another brand-name “Infantry Knife,” but is available at a fraction of the cost. The Infantry Knife is just one of many LA Police Gear branded products. Over the last several years I have become a fairly steady customer of products from LA Police Gear. Founded by a LA area police and tactical officer, LA Police Gear has expanded tremendously to offer a wide range of police, military, and civilian products. As every cop knows, if you want to have good gear, or backup gear, you often have to purchase your own. Every officer knows the paycheck only goes so far, so economy of purchases is just as important. 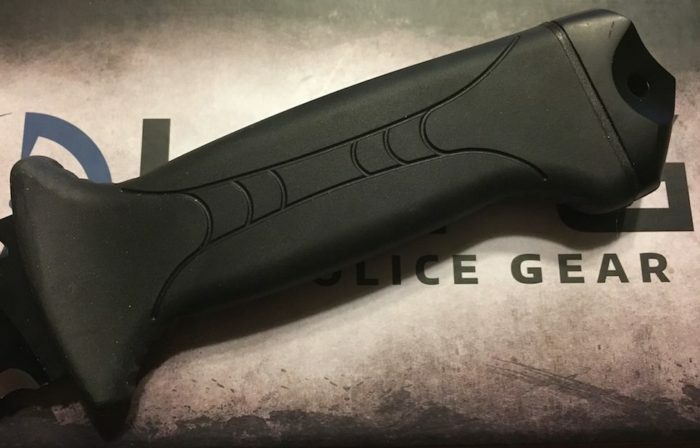 LA Police Gear was created by a cop with just those needs in mind, and the company has been able to deliver outstanding products at affordable prices. 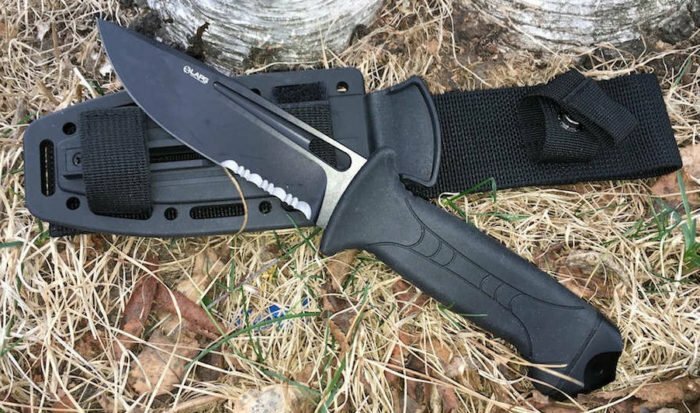 The LAPG Infantry Knife could provide good use in emergency situations. As the name implies, the LAPG Infantry Knife is purpose-built for professional duty use. This knife is not a simple pocket knife, but a fixed blade knife best deployed for more serious purposes. The LA Police Gear Infantry Knife would be a great asset on a go-bag, active shooter response bag, sniper pack, or on a tactical vest. Other applications could include a camping or hiking knife, or an emergency knife for road travel. Gerber’s LMF II Infantry Knife. The Gerber LMF II Infantry Knife costs over twice as much. LAPG Infantry Knife appears ready for tough jobs. The LAPG Infantry knife uses 440B stainless steel for its blade. This steel was once very common in knife manufacturing, but as the steel and knife industry have greatly expanded, so too have the steels being used for knife-making. However, 440B stainless steel is still a good steel and can be quite capable of many uses. The LA Police Gear Infantry Knife comes with a nice, sharp edge on the blade right out of the box. According to some knife forums, 440B stainless steel takes an edge fairly easily and maintains that edge through most general applications. Since 440B stainless steel is an older variety of steel, there are obviously better steels available (and worse ones too). In general though, this steel should be able to accomplish most of the tasks it is presented with. You might not be able to slice through a tomato as smoothly as a fine Japanese chef knife, but then again this knife wasn’t really designed for that anyway. 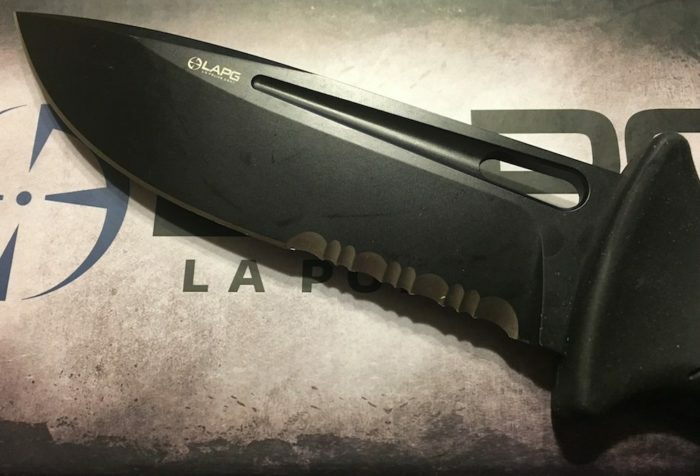 LAPG uses 440B stainless steel for its Infantry Knife blade. The Infantry Knife uses a drop point blade configuration. A drop point blade provides a wide range of uses from cutting, slashing, and stabbing. The overall blade is 5.0 inches long, so this knife is more of a heavy or special jobs knife, and not an everyday carry (EDC) knife. In addition, there is a 1.75-inch section of serrations at the back of the edge to assist with heavy cutting jobs. The serrations are a fairly common combination of scalloped and wavy cuts. This allows the serrations to grab materials with finer and bigger cuts, that should help cut through heavier materials. The spine of the LAPG Infantry knife remains consistently thick for 3.75 inches before taking a slight tapering down the remainder of the blade to the point. The LAPG Infantry Knife still has reasonably strong blade support for heavy work, to include chopping and smaller prying jobs. The tapering of the blade cheek and tip adds some aesthetic appeal. Just below the spine there a machined groove that ends with an oval cut-out near the guard. This appears to be just for aesthetic purposes, and to lower the overall weight a bit. However, some buyers have suggested it might fit an EMT’s oxygen bottle valve, or allow a good lashing point for cords to fashion a spear in a survival situation. The blade is coated in a black outer layering, but it does not appear to be a permanent coating or chemically bonded protection either. This outer coating should provide decent protection from the elements while it lasts, but prolonged and heavy use will most likely scrape the coating away and expose the steel below. The 440B stainless steel will provide additional corrosion and rust protection, but since it is a mid-level stainless steel so it will not be completely impervious to prolonged exposures. The rubber-molded handle on the LAPG Infantry Knife provides a comfortable and tacky grip. The LA Police Gear Infantry Knife has a partial tang, that tapers down to about half the width of the blade, and extends almost to the steel pommel insert. This is a disappointing feature, as a full tang knife is far superior in strength in my opinion. The handle is a rubber-molding that is very comfortable, and provides a slightly tacky texture. This texture is very good even in wet conditions. Though the rubber-molding feels soft and tacky its exterior surface, I’ve found it to have an acceptable tensile strength as well. Light to moderate prying actions should be fine, but I would heavy actions with this handle. Also, I would doubt this material would do well with prolonged exposure to harsh chemicals. The two-headed guard extends out just enough to provide protection from the user’s knife hand sliding forward, but not enough to get in the way. 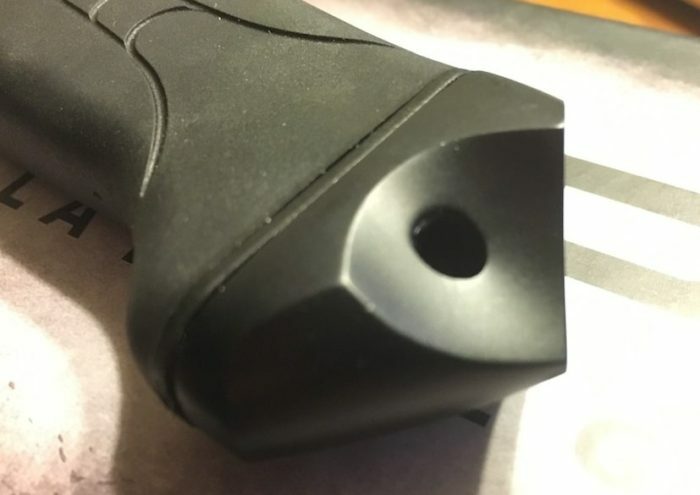 On the back side of the guard there are a series of serrations in the robber-molded grip providing additional gripping strength for jobs requiring more pressure to finish. On the back underside of the handle there are more serrations to help support the pinky finger of the user’s knife hand should a striking action be taken with the pommel. In the middle of the grip there are a series of small channels to help guide water, sweat, blood, or other liquids away from the user’s hand. The LAPG Infantry Knife pommel doubles as a window break or striking point. Speaking of pommel, the LAPG Infantry Knife has a steel pommel that taper down into a fine, but not too sharp point. This gives the knife the ability to be used as a window break in emergency situations, or as a very effective striking point in a self-defense application. 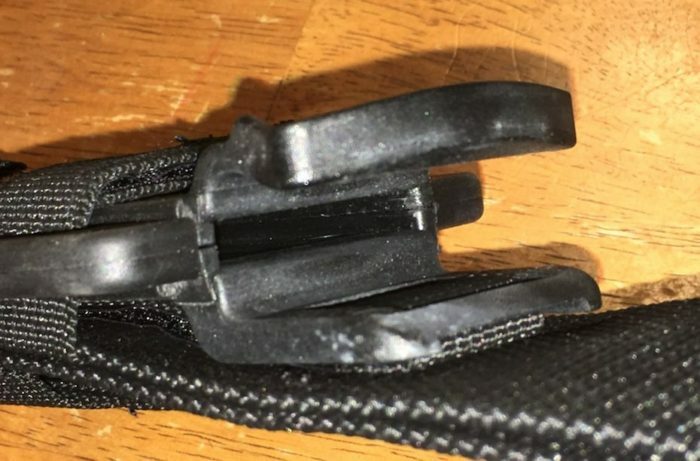 There is a lanyard hole in the window-break pommel large enough for 550 Paracord or other similar cord should the user want to carry the Infantry Knife in that manner. The LAPG Infantry Knife and its sheath. The sheath has several mounting options. LA Police Gear includes a nice Molle and rubber-molded sheath for the Infantry Knife. The sheath has a large loop at top to ride on larger duty belts in a drop-down fashion. There is also two smaller loops on the back side (body side) of the big loop, that can be used on more traditional belt sizes. 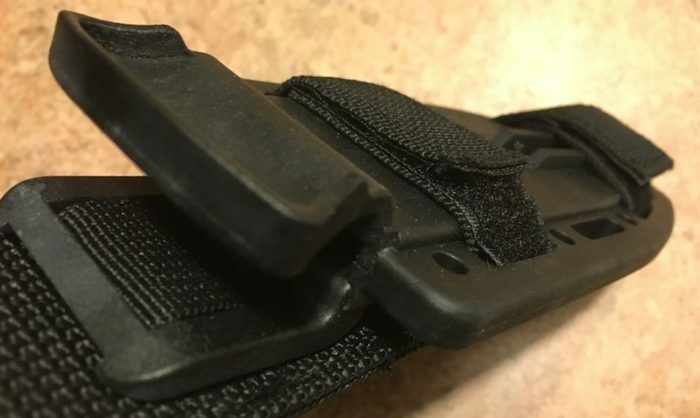 These smaller loops can also be used to attach on a pack with Molle straps or other means. These smaller loops have a snap at the bottom to provide quick attachment or removal. For those preferring to mount to a pack, the sheath has both 550 Paracord holes, as well as larger slots for leather or nylon straps. The knife clicks into the sheath with an audible and tactile snap when the retention pressure grabs the knife. This same pressure holds the knife in place, and provides slight resistance when removing the knife from the sheath. There is a nylon strap that snaps together to keep the handle if the Infantry Knife close to the big sheath loop when in the sheath. Overall this is a pretty nice sheath, and definitely holds the knife much better than simple nylon or leather sheaths. The LAPG Infantry Knife rubber-molded sheath has tension lock. Obviously a knife with the name “infantry” should be capable of a variety of applications. What immediately comes to mind is a last-ditch survival or self-defense tool. In that regard the LA Police Gear Infantry Knife will have no problems stabbing, cutting, or slashing against a deadly threat. From its drop-point blade design with very sharp tip to the combination razor and serrated edge, this knife can be deadly. In addition, the steel pommel with striking point has the potential to be devastating to an attacker as well. An infantry knife should also be able to perform heavy jobs to secure a soldier’s position. This could include digging, cutting, or chopping. The digging part is not going to be great due to the narrow blade width, but in a pinch its possible. I have had a chance to do some cutting and chopping. The 440B stainless steel blade comes with a nice sharp edge on it, and I had no problems cutting through 550 Paracord, nylon, cardboard, and similar materials. The blade stayed sharp, and did not show signs of damage or wear, including the black coating. LAPG Infantry Knife chopped through a 2-inch limb in about a minute. 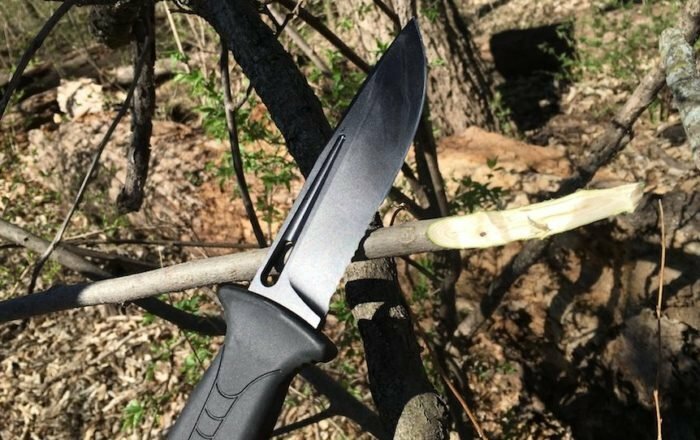 Then I went into the woods and chopped through a few branches to test the LAPG Infantry Knife’s ability at chopping and other survival work. The Infantry Knife had no problems with finger-sized branches, cutting through in roughly 5-6 chops. I then moved on to a 2-inch diameter branch to see if the knife would handle making more robust fire wood. It took me about 1-minute to chop through the branch, with each chop cutting a nice section of wood free. When examining the knife afterwards I found only some smudge marks, but no permanent damage. The blade edge remained sharp as well. This seems to confirm the LAPG Infantry knife does have outdoor, survival, and heavy job capabilities. Obviously more strenuous and continuous heavy work will ultimately take a toll on the blade’s edge, and re-sharpening will need to take place. The classic “V” of flat ground edge should sharpen rather easily, but will require the user to carefully ensure the two edges remain equal. The 440B stainless steel is capable of holding an edge, yet soft enough to sharpen up when needed. Smaller branches were no problem, usually taking only 5-6 chops to cut through. Overall I really like the LA Police Gear Infantry Knife. The features on this knife are nice, and there are several practical and emergency applications. The blade steel is decent quality and should hold up under the intended types of jobs. The steel is capable of being sharpened fairly easily and holds a decent edge. The knife that shaped the design of this knife has better steel, and a few more features, but also comes in at over twice the cost. 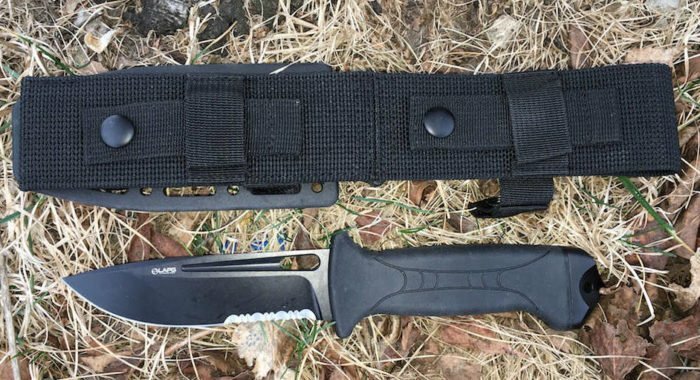 If you’re planning on working in and around salt water a lot, or plan on chopping rocks, then the LA Police Gear Infantry Knife may not be the right choice for your applications. However, if you need a good knife for heavier jobs and self-defense under more normal conditions, this knife appears ready to handle the tasks. The sheath is well made and versatile in carry options. The snap-in, snap-out friction retention system is a very good selection for this knife. The pressure is enough to hold the knife secure under rigorous movements, but still capable of fast withdrawal with a reasonable amount of force. For only around $30.00 you’re getting a lot of knife and features. I’m glad I bought one. A final look at the LAPG Infantry Knife, a pretty good buy for only $30.